The Volatility (VIX) term structure is most commonly in a complacent “contango”(rising from left to right) state. The VXX ticker symbol looks like any other stock such as IBM or AAPL. But it’s not like a stock. It doesn’t give you ownership in any corporation. There’s no quarterly earnings report or dividend distribution. Instead, it’s an exchange traded note (ETN). ETNs are similar to ETFs, except they are debt instruments. But that’s just a technicality. The point is that does continuous trading around the volatility term structure. It continually, buys the (higher) second month volatility and sells the (lower) front month volatility. It continually buys high and sells low — and therefore just keeps losing money and decays towards 0. The difference between these two levels is what VXX is all about. Since we said above that the VXX is continually buying the second month VIX level and selling the front month VIX level, if the term structure is sloping upwards – then that means this VXX algorithm is always buying high and selling low. That’s NOT what you’re supposed to do to make money! And that’s exactly what VXX does — it loses money almost all the time. As long as the market is in a complacent state — and generally that means an upward sloping VIX term structure – most commonly referred to as “contango” — then the VXX will continually trend towards 0. Say What? And Why Is This Effective? Because in a normally functioning market ( from 2009 til present) – there exists something called a “contango” environment in the volatility term structure. All this means is that the second month volatility is higher than the first month volatility. And so anything that buys the 2nd month and sells the front month on a continuous basis – will lose money over time — as long as we are in a contango environment. If we short this, then we can make money as long as we are in a contango environment. We can think of the ratio of the 1st month divided by the second month to determine what kind of environment we are in. I am convinced that VXX is mathematically structured to decay towards 0 — tons of articles across the web talk about it — and even when there are jumps — as long as you hold on, over time, it will continue towards 0. 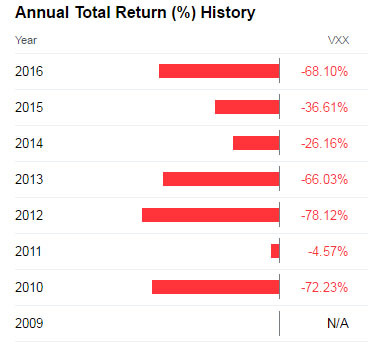 Sometimes the pain can be a jump of 50% or more – but historically for the past 8 years, VXX has just puked every year – some -60% performance every year. The VXX continues to reverse split just so the numbers don’t get infinitesimally small. Even in this past 8 months — you can see below that Brexit (June 2016) happened when VXX was around 65. While there were spikes up –just these past 8 month or so it has decayed from 65 to below 20. That’s around -70%. Long term – back in 2009/2010 – the equivalent VXX was reverse splitted – until the value was close to 30,000. It’s down some 99.99% – and will continue to reverse split so the numbers look normal — but don’t let that fool you. This thing continually drifts towards 0. You can look up the long term chart of VXX on Yahoo Finance – split-adjusted value in 2010 is 30,000! In the future, this will go even higher. One day, our current $18.81 value will be 30,000 — it’s just the nature of how this is designed. In fact, at the time of publishing this article, the VXX has dropped below 16 – just a few weeks later. The VXX will never get back to where it was in 2010 at 30,0000 — or even where it was in 2014 or 2015 or 2016. It’s just mathematically impossible. For every single year — VXX has lost ~60%+ — on average — even when there was a volatile year. The exceptions were 2011, 2014, 2015. But in 2010, 2012, 2013, and 2016 – we saw declines of over 60%. Generally, when the SPY goes up, VXX goes down. When SPY goes down, VXX goes up. But when SPY goes flat — VXX actually goes slightly down—which is good for the long term VXX short. This is where the magic happens. This is what I see on a micro-time scale. If there’s a high probability investment — this is it. In fact, every time I expected a rally and I held decaying SPY calls — when the market “got stuck” and I lost money on time decay, the VXX — on the other hand — actually made money. I use wave patterns to help me predict directions – I’m generally more right then wrong in terms of directions (we did rally) — but selecting a proper trading vehicle is what actually makes you money. I can call the direction correctly, but if it only moves a tiny bit, I could lose more on time decay from long call options –even if directional call was correct. Long calls only do well if there’s a big move – not when there is a tiny move up. Moreover, because of the election volatility, I was scared out of position such that when the rally did happen, my position size was too small. By the time I re-entered in full, the market simply got “stuck” and didn’t go anywhere. I am certain that if I used the VXX trading vehicle — instead of decaying SPY calls — your account would be well into positive territory. I have no doubt about that. My wave pattern analysis can help enhance/confirm when to exit the algorithm – if I see a bearish pattern develop that the algorithm wouldn’t pick up until days later. It can also confirm that the algorithm should indeed be on. The wave pattern analysis can act as an extra precaution on top of the built-in turn off switch in the algorithm itself. This strategy does best with time to see results. 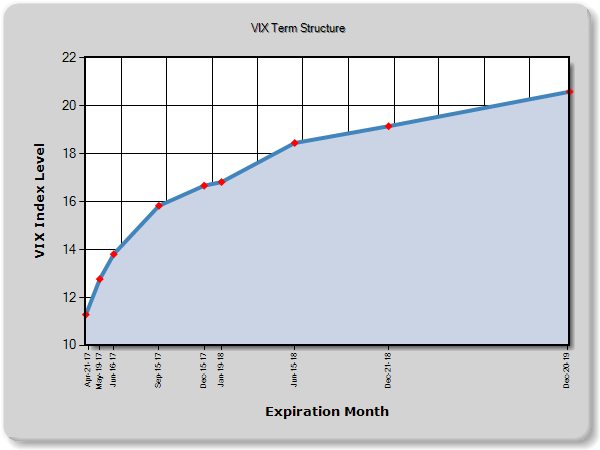 The long term charts of VXX show how effective time works in its favor as it decays to 0. To Leverage Or Not To Leverage? 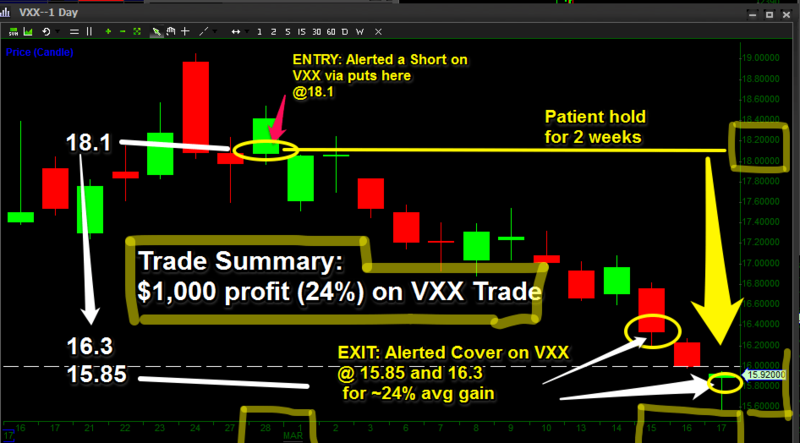 I’ve been trying to enhance and leverage up on the VXX trade by recommending a VXX put or subscribers on Feb 28. At first, it appeared the trade was not going anywhere. VXX looked like it was gearing up for a big rally — even when the S&P made a massive rally, the VXX did not drop, which is usually what happens during rally. Instead, the VXX also went up – something that rarely happens. But we patiently held on to the VXX short. Even when the VXX finally started going down, the puts did not gain in value. Instead, they were flat or even slightly negative. It wasn’t until 2 weeks later that the the VXX started to drop more quickly – this is when the puts finally picked up steam. 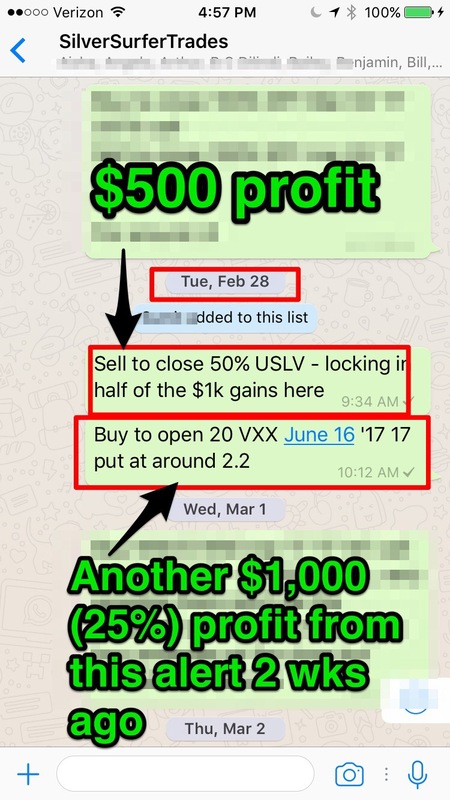 The end result was risking: $4,400 – and making a 24% return or ~$1k 2 weeks later. If we used that $4,400 – and doubled up on margin to $8,800 — let’s just say $8k for estimation purposes. If we shorted VXX at $18.1 down to 15.85 for a -12.5% drop – — that $8 would have generated a 12.5 % gain of $1,000 — which is roughly the same as how much we made on the June (5 months out) puts. So using options to leverage up is a bit trickier than expected. If we shorted the VXX on margin, we would have gotten the same profit results as we did on the 5 month puts — but we would have seen green numbers in our account earlier than we did with the puts. If you don’t see green numbers, you might start to lose conviction and bail out. So sometimes it’s helpful to see the green numbers with the VXX short instead of put. So with puts -it comes down to entering at the right time. You can get bigger returns by choosing 1-month-3 month puts — but if the VXX gets stuck during that time, you could end up losing money on the trade. So I would say for large amounts of capital, using the VXX on margin may be a better alternative. The inverse, XIV, is also a great alternative I’ve been using. However, there is some decay there – which we can get to another time. The VXX short is perhaps the best long term strategy – as long as the market is in a complacent state. The straight up short on the VXX is best when there is some panic on the event. You can leverage up with puts – but timing becomes super critical. Otherwise, you could end up losing on time decay. 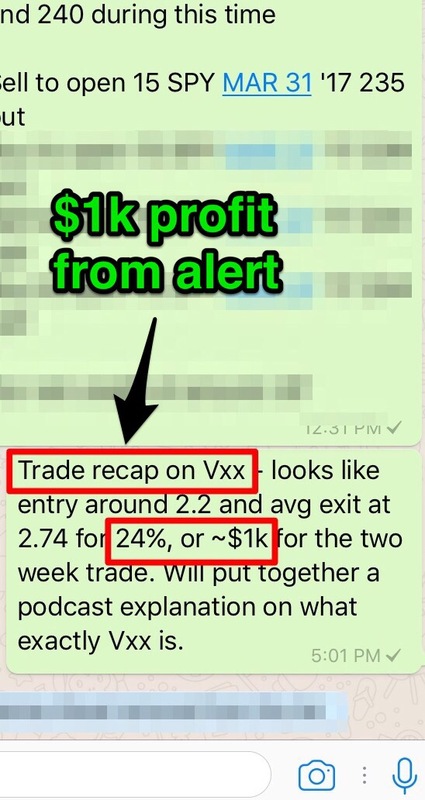 To get trade alerts related to VXX, sign up here.